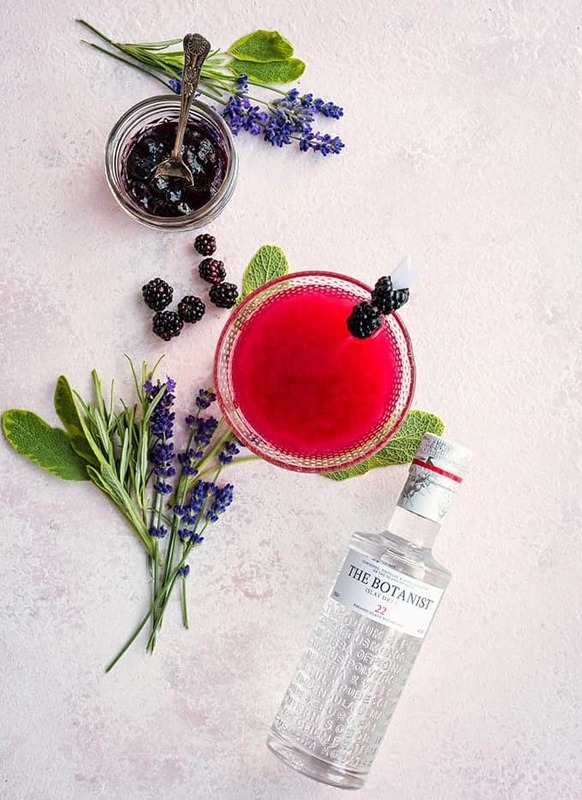 The Botanist gin cocktail uses blackberry jam to create a beautifully vibrant and delicious drink. This has been a bumper season for blackberries – I honestly never seen so many and I have been picking bags and bags of them. Most have been turned into jam, which has found its way into my cakes and, of course, cocktails. Blackberries have such a unique sweet but tart taste and they pair incredibly well with gin. Of course there’s a quite famous cocktail that uses Creme de Mure and gin – the Bramble. But I don’t know many households that have a bottle of that stuff hiding in their drinks cabinet and blackberry jam works incredibly well to replace it. For the blackberry jam I have been using equal amounts of fruit and jam sugar (which contains pectin) plus juice and zest of half a lemon. Rinse the blackberries well, then put them in a large pot together with the lemon juice and zest. Gently heat the fruit and mash them lightly with a potato masher, stir in the sugar and then gradually bring to a rolling boil – follow instructions on the sugar packaging for how long to cook the jam. Alternatively use pectin powder and regular granulated sugar. If making jam is not your jam (see what I did there) use store-bought seedless blackberry jam. I love making jam, but I don’t love the whole preserving process so I usually make a small batch and keep it in the fridge for immediate use. I used The Botanist gin in this cocktail – a match made in heaven since it uses 22 hand-foraged botanicals local to the Island of Islay as well as 9 more traditional gin botanicals. It is a beautiful gin that comes packaged in an equally beautiful bottle – well worth seeking out. The Botanist gin cocktail uses blackberry jam to create a beautifully vibrant and delicious drink. Please note this recipe serves 2. Put two martini glasses in the freezer to cool - or fill them with ice for 5 minutes. Put the gin, lemon juice, jam and plenty of ice in your cocktail shaker. Shake really hard for 30 seconds and use a straw to taste it. You might want to add a bit more lemon juice depending on how sweet your jam is. Strain the cocktail between the two chilled glasses and garnish with fresh blackberries threaded onto a cocktail stick.